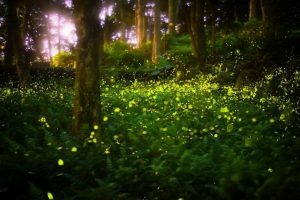 The annual peak viewing of the Synchronous Fireflies at Elkmont in Great Smoky Mountains National Park begins May 30, 2017 and runs through June 6. This annual event is unique in North America and very rare in the world, matched only in southeast Asia. A species of firefly flashes its light in sync with thousands of its fellow fireflies. 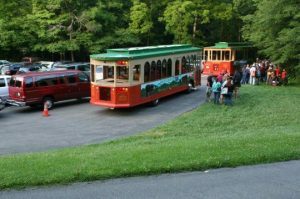 People come from all over the world to see it, and viewing space is very limited, and controlled by the rangers of Great Smoky Mountains National Park, which holds the premium location to view this event. This year more than 18,000 people applied for one of the 1,800 parking spaces, and on May 10 the lucky winners were notified. For 8 days, by car, van, bus and city trolley these people are allowed into this very special event. You can see this phenomenon outside of the park’s prime viewing area at Elkmont, and outside of the dates estimated to be the prime time. Reports come from individual hikers, and comments here and there, but it’s very much an occurrence that’s hard to see. It’s also a very difficult thing to capture in photographs or film, and there are etiquette protocols to observe (such as not shining bright lights) to prevent disturbing the process. The firefly represents more than just how incredible and full of unexplained variety our world is. It reminds us of our younger days running around outside with our neighborhood friends as the sun would set, our parents calling our names to come back inside and get ready for bed. The Smoky Mountains and its surrounding land are truly amazing, alive with vivid colors, soaring peaks and energized waterfalls. But perhaps there’s a finale of sorts that really puts a cap on another successful year of hosting nature-loving guests. That finale is the Elkmont Fireflies show. In late May into early June, thousands of fireflies bring life to the Elkmont campground every year. If you’re one of the lucky few to see it, you’re in for one of nature’s marvels as the glowing fireflies are clearly visible to the human eye, but they’re extremely hard to film or catch in a photo. This is an event so rare you have to go to Southeast Asia to see anything like it in the world. These aren’t just ordinary fireflies. They’re synchronous fireflies. Their glowing bodies light up together in unison, flashing quickly on and off in what may seem like a random pattern, but then they pause the show for five seconds, everything going dark, before beaming again. You realize mother nature has endowed them with a mating ritual of a perfectly synchronized lightshow. Though they are called fireflies, these little creatures are actually beetles — small flying beetles that possess the most unique light-up abdomen. The light they emit is the result of a chemical reaction between luciferin and oxygen. It does not give off any heat and its only purpose is to attract a mate. The lucky 1,000 each night who get to make the Elkmont Fireflies a part of their memorable trip to the Smoky Mountains are told not to emit any of their own bright light, since that can disrupt the fireflies. They must put blue or red cellophane over their flashlight lens for navigating around before settling into their chairs or blanket setups. If the moon is particularly bright on any given evening, they wait in anticipation as the fireflies delay the show by about 30 minutes. This year, the lottery for tickets to the show is over, the families are anxiously awaiting their chance to see the show and the fireflies are on the verge of mustering up their best performance for peak mating season. For those of us who unfortunately cannot be there this year, we can only hope someone is lucky enough to snap a picture we can all admire.